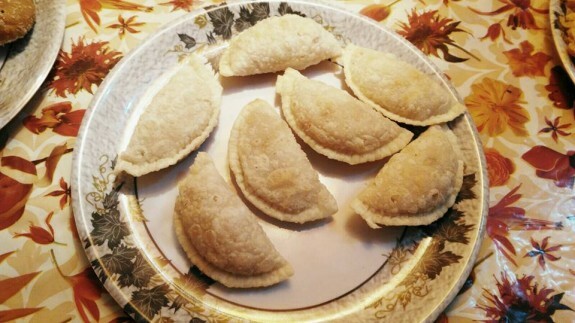 Gujiya is a popular sweet dish from North India during Holi or Diwali festivals, however, almost same sweet karanjis which is popular of Maharashtra made with the stuffing of coconut, poppy seeds, sesame seeds as well as dry fruits. In Bengal, the same sweet is named as Pithe(fried) with the stuffing of khoya or coconut with jaggery by using some dry fruits too. Whatever the name is, the recipe is almost same for all with little difference in stuffing. I made the outer part with all purpose flour; however, you can also use whole wheat flour or half-half of both. You can either bake or fried the giujiya. Here I make the fried one for which the recipe is given below. 1. Take all purpose flour and salt in a big bowl and mix it. 2. Heat ghee in a pan and pour it on the flour mixture. Now, rub the ghee with the flours by your fingertips to give a breadcrumb like texture. 3. Now, add water part by part and begin to knead to form dough. 4. Cover the dough with moist cloth and keep it aside for 15-20 mins. 1. First crumble and grate the khoya and chopped the dry fruits. 2. Heat ½ tsp ghee in a small pan and add the crumbled khoya into it. Stir it continuously on low heat. 3. Cook the khoya properly and then switch off the flame and keep it aside. Let it cool down completely. 4. Now, add chopped dry fruits, cardamom powder and powder sugar ad mix everything well so that any lumps would not present. Check the taste and if required add more sugar. 1. Slice or cut equal parts of small balls from the dough and place all the balls in the same bowl. 2. Dust the rolling board lightly with some flour. Roll each ball with rolling pin to give a small circle with diameter of 4 to 5 inches. Don’t use too much flour while rolling. 3. Now, apply little water with your fingertip all over the circumference edge. Place 1 Tbsp khoya filling on one side of the circle by keeping the edges little empty. Now, carefully bring together both the edges and join. Lightly press the joint edges. 4. With a small gujia cutter, you can trim the edges or it is good if you can make pleated design at the edges. Just keep small folding and twisting the edges till the end. 5. Prepare all the gujiyas in this way and place it on a plate. 6. Heat oil in a Deep frying pan or Kadai. 7. Gently slid the stuffed gujiyas on the oil. Don’t add all at a time. Deep fry the gujiyas. 8. Drain it on kitchen tissue paper and make it cool. Store them in air tight container and serve these to your family or guests.